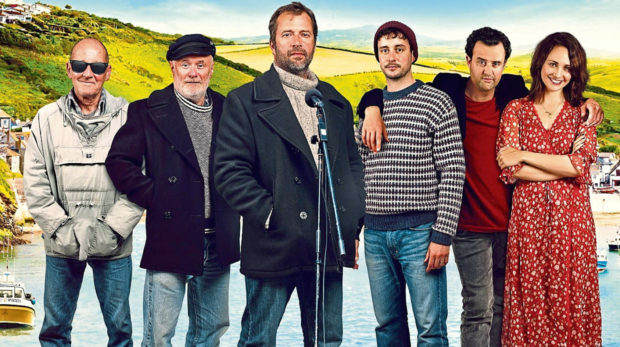 Fisherman’s Friends is the uplifting true story of the part-time Cornish sea shanty group that hit the big time. The new, heartwarming comedy is inspired by the true story of Port Isaac’s Fishermen’s Friends, who went from singing in the village harbour to securing a deal with Island Records, a Top 10 album and performing on the pyramid stage at Glastonbury. It’s the latest in a long line of British feelgood films and it’s hoped the picture will connect with audiences just as powerfully as movies such as The Full Monty and Calendar Girls. The film has a formidable cast full of actors you’d think you were more likely to see in a hard-hitting drama including Line Of Duty’s Daniel Mays, The Following’s James Purefoy, David Hayman from Trial And Retribution and Tuppence Middleton. But behind the wit, warmth and energy of the film lie the stark facts of a tragedy that, not featured in the movie, threatened to rob the real band of Cornish singers of their good spirits for ever. In 2013, on the last day of a small national tour, the 10-strong group’s outstanding tenor soloist, Trevor Grills, and promoter, Paul McMullen, were both killed in a backstage accident. The group’s second album had been recorded a few weeks before but its release was put on hold, as was early talk of a film charting their meteoric rise. The remaining band members turned down a chance to tour America. For the new film’s other writer, Piers Ashworth, the cinematic celebration of the humour and camaraderie of the original Fisherman’s Friends comes at the right time for the band. The original a cappella band, comprising genuine fishermen, a shopkeeper, a potter, an engineer and two builders, started performing in pubs during the mid-1990s. Nine of the original singers – aged from 36 to 68 – had grown up in Port Isaac, the town now also known as the location of the fictional Portwenn in Doc Martin. The 10th member, a fisherman from nearby Padstow, Jason Nicholas, was invited to join as accordion player. His manager was also intrigued and came to Cornwall to hear them sing, and eventually helped secure them a £1m recording contract with Universal Music. In 2010 the band’s debut album made the Top 10, selling 150,000 copies. The film takes some licence with the truth as it focuses on the fictional character of a cynical London music executive, played by Mays, who has little faith in the troupe. Fisherman’s Friends (12A) is in cinemas from Friday March 15.